Everybody’s voice is important. All of our voices create the tapestry of sound and every voice is a thread in that tapestry. If you are missing a voice, you are missing some color. 1. 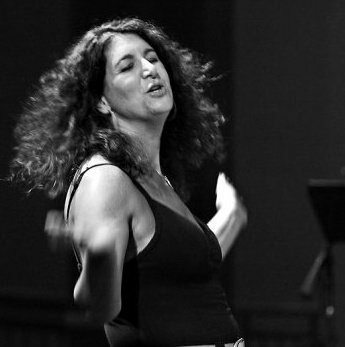 What led you to the mission of being an artistic director of a community chorus? Music is the way I’ve perceived and understood the world my whole life. It’s in music that the whole world always makes sense to me. That’s when I’m in the flow. When I was a kid I didn’t know what that meant, I just knew how it felt. I don’t ever remember not being involved in music. I started playing the piano by ear when I was three. I knew I wanted to be a teacher but I didn’t want music to be my work. I wanted it to be my love. Music was so important to my soul. I went to school to become a teacher and get an education degree. I dabbled in music here and there, gave a recital, and sang in a couple of college choirs. But I ended up failing out of school. That wasn’t so unusual because I wasn’t a terribly happy teenager or good student — except in music. As a kid, I had experiences that were painful. Music was a safe place for me and that’s where I went when I needed to be safe. The experiences that I had as a kid led me to lose my voice – figuratively not literally. I was sick a lot and had strep throat all the time. 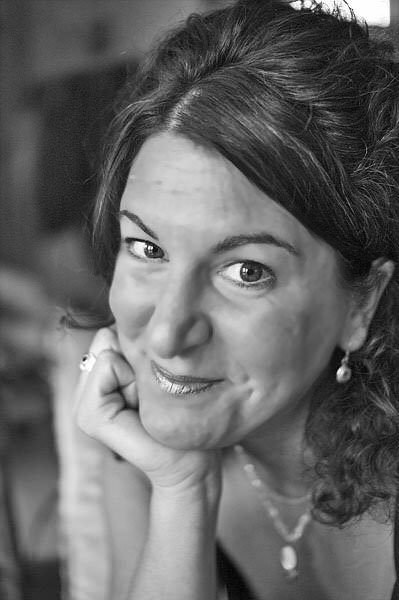 From age five on I was involved with choral programs and was in a music program at school. In this area I was always successful. Later in college, I was kicked out of school. I wasn’t performing the way I needed to and when I was out of school I went back to studying piano. I took a couple of music classes at a local university. My piano teacher gave me a student to teach. I was about nineteen or twenty at the time. For the first time in my life I was getting straight A’s in school and I loved teaching this kid. I started thinking about going back to music and teaching music. For the first time everything was working well. I ended up going and getting a degree in music education. I moved to the Boston area and started teaching. I was a choral director at a middle school. I loved it! Kids loved coming and singing with me. I don’t really know why, but I had knack for building choral programs and getting people to sing. When I was teaching middle school, somebody gave me Kay Gardner’s book. She was a pioneer in the self healing movement. (Learn more about Kay Gardner by clicking on this link.) I had been studying music with mostly men – which is fine – but Kay Gardner was different and was describing the spiritual aspects of music. She was classically trained musician who had come around to understanding why we all felt better when we were involved with music. This is an ancient art or practice. Someone gave me her book. She was giving words to thoughts and feelings that I had had but had never really been able to express. Jumping ahead, I actually became Kay Gardner’s apprentice and she became my mentor for three years. I sort of “found her” and asked her a lot of questions. I tried to understand why music worked and why this powerful thing was happening when I was bringing people together for music. I thought we could have a community event, open the doors, and have anybody that wanted to come, come and make an offering. Whoever wanted to show up would make the choir. We would sing Paul Winter’s work of music. I was hoping to get seventy people. One hundred and forty people showed up that night. We ended up raising ten thousand dollars for the organization that we were benefiting. This was magic happening with singing. It was amazing. A couple of years later, we did the concert again through the church and for the local food pantry. A hundred and forty people showed up and we made twelve thousand dollars. We gave away two thousand pounds of food. We sold out the auditorium and this was little Maine! 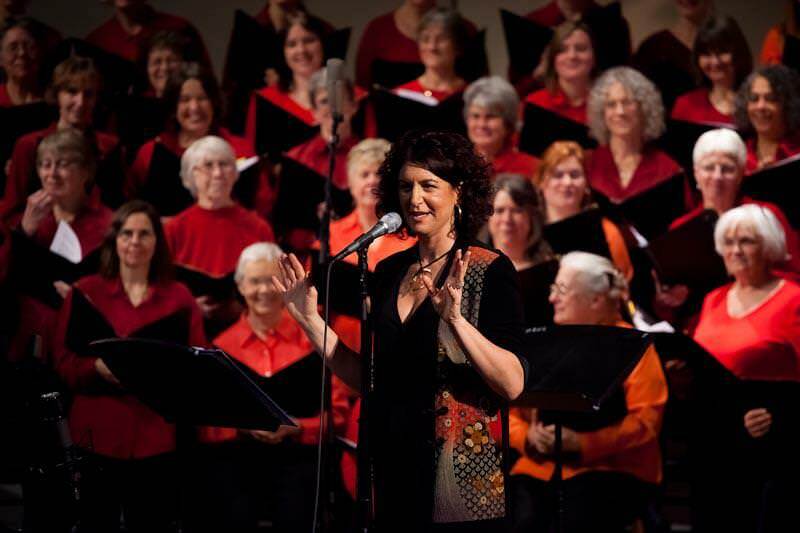 I started building my philosophy through congregational singing. You didn’t have to be able to read music. You didn’t have to sound like the person singing next to you. You didn’t have to worry about singing a wrong note. That’s not why you are singing a hymn right now. The reason why you are singing is to express something good. I’ve always believed that everybody’s voice is important. I have the ability to help people find the joy in music and a connection through music. I have a belief system that all of our voices create the tapestry of sound and every voice is a thread in that tapestry. If you are missing a voice, you are missing some color. That’s how I describe it to my singers and teaching. With this approach, people feel like they matter. This is my life’s work. This work pulls together and calls on all the fingers of the training I have had. I’ve had training to be a classical concert pianist. Besides being a pianist, I’ve done chanting and I’ve done folk music. I’ve studied with master choral directors and I’ve studied with song leaders who don’t read music. It was very lonely being a concert pianist. I had to sit in a room alone for six hours a day. I love music and I love to be alone sometimes, but there is much more fun and energy being with others and making music. So I continued on with choral music. Now I’m creating my own stew out of all that training. It’s not all brand new, but I bring my own spin to it. A part of this journey is finding my own voice and I’m still finding my voice in new ways. I mean that figuratively and literally. I believe the voice is the sound of the soul. Every voice deserves to be heard. When you tell people that they deserve to be heard, it means a lot to them. Then you listen to them. Then you tell them that what they have created is beautiful. In the chorus, we work out of love. Someone told me on a day that I was particularly frustrated, “Beat them into submission, take charge.” The thought came into my head, “Love them into excellence.” Rather than beating the music into singers, I try to pull it out of them. I love them into excellence. When directing becomes an act of love, then it takes on something that is beyond what we can create and enters into the expressive realm. That’s is what is special about being a choral director. I don’t always feel comfortable before a performance. I have to stand in front of a hundred and forty people every week. I have to know not only what I am doing, but be prepared to deal with what I don’t know is going to show up. That could be me feeling disconnected or finding the chorus had something right last week but this week everything has fallen apart. We are always working with the clock. The singers all have different abilities. There are times when I really find it hard to be called to be a builder and a leader. But I keep on keeping on – even though sometimes it is tiring and hard. 3. 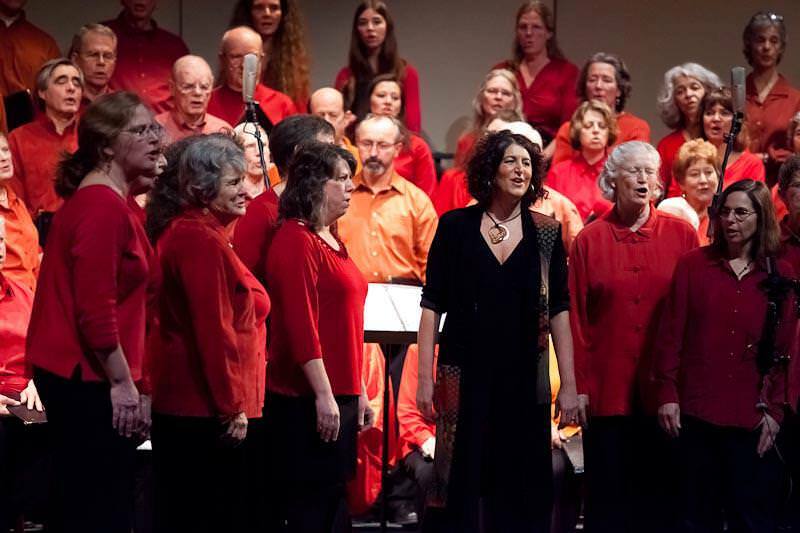 What was your best day as an artistic director of a community chorus? There are best moments. One is when we are learning a new piece of music. There is a moment when we are not working any more. I get a wave of emotion or energy. It is tactile. It is something that I can actually feel. I will tear up. I’ll say to the chorus, “I got a vision.” It’s about being energetic and open. It’s like, “Oh we just got a hit of the energy.” That is when everything is lined up – the moment when we are all lined up together – a hundred and forty people in a room. We are all experiencing the same thing at the same time. That’s a great moment. That is what we do it for. When you have a hundred and forty singers singing We Shall Overcome, it carries a very strong energy in and of itself. There is an open heart and clear intention. Then something very special happens. In our concerts, rather than thinking of all the people sitting down and listening as our audience, we think of them as our witness. We aren’t singing it for them, we are singing it with them. Their being there makes it different – makes the energy different. People will ask, “Why do people keep coming to these concerts?” We are good but not that good. Part of the reason is because we break the veil between the audience and the chorus. Music can be a performance of only those who know how to do “it”. Those who don’t know how to do “it” pay to come and listen to “it”….. so the common idea is to let the people who know how to do “it” do “it”. But we break that veil. We want everyone to participate together, to have a purpose together, and to be a community of song together. 4. What was your worst day as an artistic director of a community chorus? The worst day was when I had to fire a musician. I was at a dress rehearsal and the concert was the next day. The musician was an hour late and had been late regularly and of course there were other problems leading up to his firing. I’m a benefit of the doubt person and had thought, “Come on you can do it!” But he showed up late the last time and wasn’t prepared. We couldn’t do the show with him. At the dress rehearsal I had to call my reliable player and tell him, “I need you. Can you do it tomorrow?” Then I had to fire the other musician. I respect all the musicians that play with us. They are treated like professionals. They are paid as professionals. To have to be hard on somebody and know the chorus was aware of this was very difficult. This particular musician kept getting things wrong and was not coming in for the rehearsals. So it was very hard for me to fire him. Trust. I have to trust that I am doing the right thing. What also enables me to get through my worst days is to know that I get carried through my best days. I’ve been called to take risks in my life and have found that even if I take these risks, everything is going to turn out OK. When you are called to do something, you “kinda, gotta” do it. But there is another piece that carries me through. 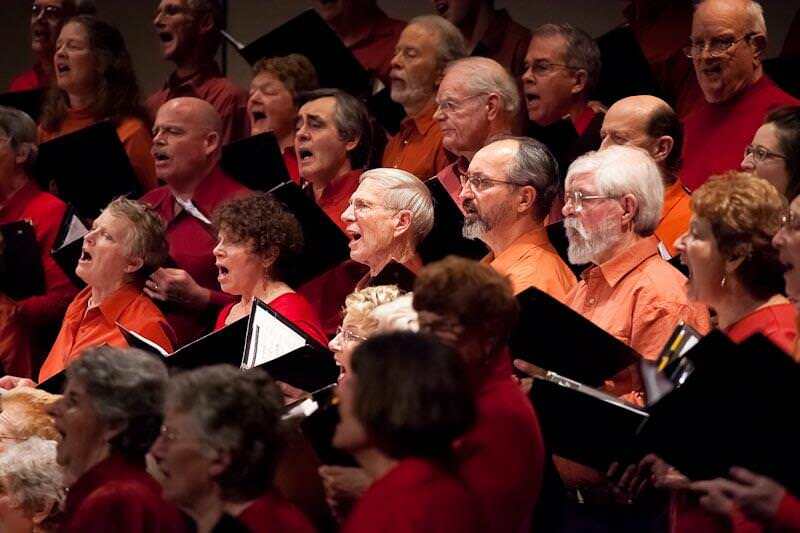 The mission of the chorus is singing as a community for the community. It’s not just me up there doing this whole thing. We have a host of volunteers and a very dedicated administrative staff. We have an outstanding accompanist. 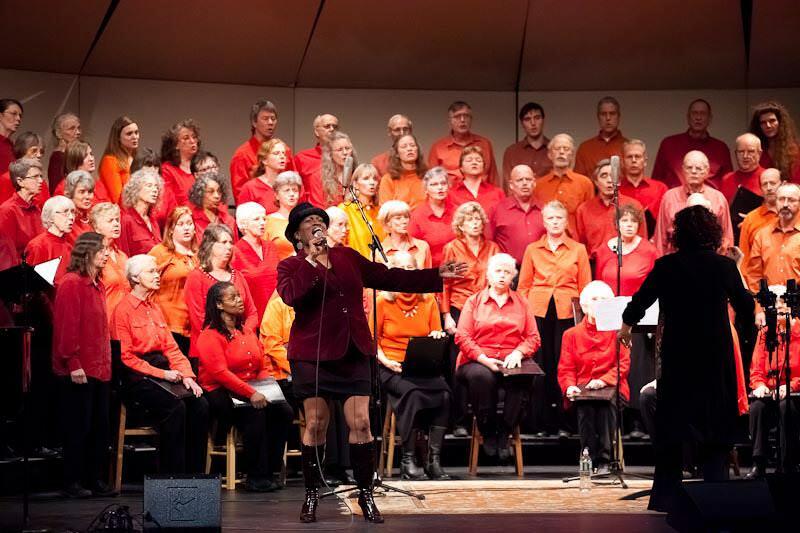 The magic of the Midcoast Community Choir is that we are a strong community. Yes, I am the visionary and founder. I want to have a replicable model to enlarge the organization to become a mentoring group to help other choirs. But the choir is something good that gives people something good to do. That’s what keeps it going – everyone together in a strong community. This is the new trend in the choral community – to have community choirs not just professional choirs. People want to participate. They don’t want to just watch any more. If you are NOT going to participate, you might as well sit at home where you are more comfortable, there is the best sound, and the best performance. But our expectation is for everyone to participate – people having something good to do together as a community. We have a children’s chorus. We have an audition chorus. We have monthly community sings. We open the doors, sing, and have a free will donation. I lead monthly the community sing and we’ve had anywhere from sixty to a hundred people show up each month. If you have one or two people who can lead songs, you can come together and sing. That’s something you can do in your community. 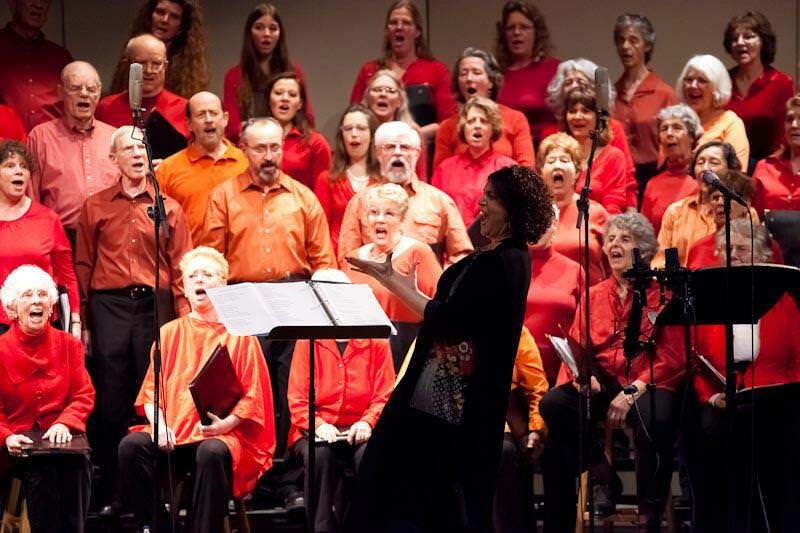 There are two different models you can have: the music comes first and the people come second – like a professional choir, or the people can come first and the music can come second – like our community chorus. So which is more important – building community or making music? When you open your doors, what’s most important is the people. Of course you need quality because people won’t stick around if it is not good. But it is the community aspect that should be the emphasis – not the perfect song. You don’t need a lot of training. If you can play three chords on the guitar, you can play four hundred folk songs. You can have an a cappella sing or you can do rounds. What is most important is coming together as a community and hearing every voice.